In a statement released to jihadist forums yesterday, Ansar Jerusalem (Ansar Bayt al Maqdis) took credit for a number of recent attacks on Egyptian security personnel in the Sinai Peninsula. The statement did not claim responsibility for today’s suicide car bomb attacks that killed at least six people; it was released a number of hours before the morning attacks. The operations of Egyptian security forces, the jihadist group charged, did not target “the mujahideen specifically, but it is a terror campaign for the families of the area in general.” It claimed that the security forces knew the villages they were targeting were empty of “mujahideen” but attacked anyway. 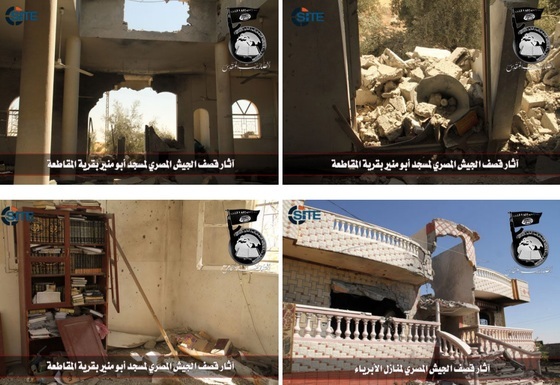 In the statement, which was accompanied by a number of photos, Ansar Jerusalem said that a number of the homes hit by Egyptian security forces in recent operations “belonged to families that have no religious leaning and belong to no organization.” In addition to destroying homes, the jihadist group accused security forces of burning a number of cars and damaging wells used for “drinking water and agricultural irrigation.” Additionally, the security forces were denounced for allegedly pillaging goods from homes that they raided. In response to the “crimes” of Egyptian security forces, Ansar Jerusalem said that its fighters took a “fast, painful response,” which included at least three attacks. In one attack, six security personnel were killed, while “a number of officers and soldiers” were allegedly killed in another. Ansar Jerusalem is thought to be behind most of the recent attacks originating from the Sinai, according to Israeli intelligence. The group, which is said to recruit within Egypt and abroad, has claimed credit for a number of attacks against Israel over the past year, including the attack on Sept. 21, 2012.